V-Ups are a great core body exercise that requires you to lift the weight of both your arms and legs by using your abdominal muscles. Planks may be great for abdominal strength, but it’s important to work different ab muscles in different ways that challenge you to lift the weight of both your arms and legs using the muscles of the abdomen. V-Ups are a more intense way to practice core strength with fewer reps and less time spent overall. Win win! If you learn how to do V-Ups you will also be challenged to practice your balance and coordination. To lift your body up and balance your legs and arms in the air at the same time, you first need to activate the entire abdominal wall to bring the weight up, and then engage the rectus abdominus to keep things in balance at the top. It will be important to relax your hip flexors during this exercise in order to keep them from taking over. V-Ups also encourage good posture and help you practice extending your spine. V-ups are an excellent complement exercise to planks. Moving between the two can give you an amazing core workout that will leave your feeling your belly like crazy! Keep in mind that abdominal exercises are important for a flat tummy but so is your eating plan. Make sure to eat clean and keep doing your cardio exercise in addition to the core strength moves like the V-Ups. What Muscles Do V-Ups Work? How Many Calories Do V-Ups Burn? 1) Lie on your back and extend your arms behind your head. Keep your feet together and toes pointed. 2) Keep your legs straight and lift them up as you simultaneously raise your upper body off the floor. Keep your core tight as you reach for your toes with your hands. Slowly lower yourself back down to the starting position. V-Ups is an abdominal exercise that strengthens your lower and upper abs, helps train your core stability, and strengthens and protects your low back. Your core, particularly your transverse abdominus, is the powerhouse of your entire body. Without a strong core you are opening yourself up to poor athletic form, back pain and general injury. V-ups is an excellent way to train your transverse abdominus to pull in correctly and keep you strong in the middle. V-ups is an exercise that promotes balance and stability. Balance and stability are crucial for overall body strength and learning how to utilize the strength of the middle of your body is so important! With over 80% of the population in the United States reporting some type of lower back pain in their life, finding a move to help prevent such problems is key. V-ups is a move that teaches your transverse abdominus to contract, which ultimately protects your lower back and helps prevent pain and injury. People often ask how many calories they are burning in their workouts. Most exercises will generally burn about 100 calories for every 10 minutes you are working at a higher intensity. Bottom line – the harder you work, the more calories you burn. V-ups benefits show less in a calorie burn and more in a core strength benefit. If you like v-ups and the results you get from it, here are a few more exercises you might want to try. V-ups are a great exercise to practice any time on its own. However, you could also incorporate it into other workouts to mix them up. Here are some ideas to make that happen. V-ups is one of many amazing exercises you will find in the following workout. This is designed to tackle that “spare tire”, “muffin top” or “love handle” area you might not be fond of. Let’s go get to work on that core! 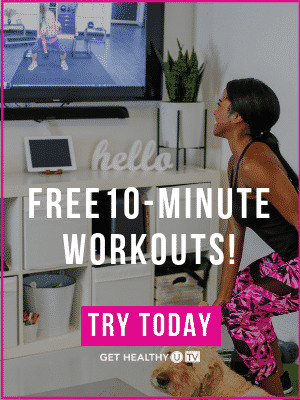 Full Body Strength Challenge: This workout uses both body weight and dumbbells for a great workout that covers all of your muscles! Grab a medium pair of dumbbells and go from one move directly to the next. Make sure you repeat 2 times! Circuit training is an excellent way to use the most of your time for exercise. You can go from circuit to circuit getting your strength, cardio and core all in one swoosh! Fat Blast Circuit Crush: Move directly from one exercise to the next with little to no break in between. Rest for 1 minute at the end then repeat the sequence. If you like the results from V-Ups, here are 3 more workouts you will love!